Meizu software engineers are hard at work tweaking on the latest Flyme 7 Android-based OS in order to push the upcoming Meizu 16s performance to its limits. 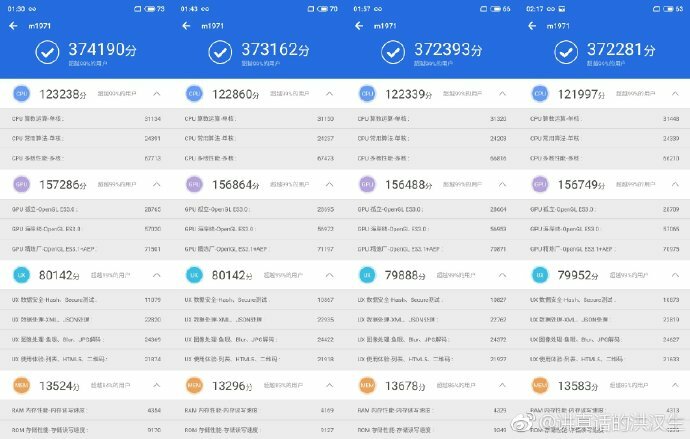 The latest batch of benchmark results revealed by Meizu system engineer Hong Hansheng are all above 370,000 points, and it looks like there is still room for improvement. The Meizu system engineers already posted the first Meizu 16s preliminary benchmarks on AnTuTu a few weeks ago, proving that the upcoming smartphone is faster than any other flagship released to date. Meanwhile, TENAA confirmed some rumored specs and also posted front and rear renders (although not too clear, due to the black casing), so the model should officially be announced soon. Just recently, Meizu system engineer Hong Hansheng released a fresh batch of scores that show up to 5% improvements over the previous tests, hinting at even better scores by release time. It looks like Meizu is still tweaking their software to take advantage of the new Snapdragon 855 SoC. While the previous score of 357,975 points was already higher than Apple’s iPhone XS Max, the new batch of 4 consecutive tests show scores over 372,000, with the highest one reaching 374,190 points. According to GSMArena, these new scores are even higher than those coming from the unreleased Asus Zenfone 6 and OPPO Reno 10x Zoom handhelds that are expected to launch in late April. This is even more impressive since the Meizu 16s is confirmed to get only 6 GB of RAM and 128 GB storage. 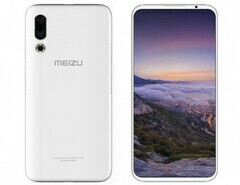 Apparently, Meizu’s software engineers are working on an improved version of the Android-based Flyme 7 OS to ensure top performance. Other specs for the Meizu 16s include a 6.2-inch FHD+ screen with 18.6:9 aspect ratio and a notch-less design that puts the selfie cam on the upper frontal case rim. The rear cam setup includes a 48 MP sensor and the fingerprint sensor is now included in the display.